The spring of 2015 in Morris County will be remembered for loons and grebes. Unprecedented numbers continue to occur on the larger bodies of water, especially Lake Hopatcong and Boonton Reservoir. 42 Common Loons are at Lake Hopatcong from Bertrand Island to Lake Forest. Horned Grebes were either hiding or absent. A beautiful Red-necked Grebe (pictured above) was floating near the Lake Forest Yacht Club. Adding to the mix were 5 Bonaparte’s Gulls and 1 Lesser Black-backed Gull. The Bald Eagles of Halsey Island have two eaglets poking their heads out of the distant nest. Boonton Reservoir tallied 40 Common Loons this afternoon. 25 were in one group. A flotilla of 7 Red-necked Grebes was in the same area as the loon raft. 11 Horned Grebes were scattered at the north end of the reservoir. A lone Red-throated Loon was also in the north end (see photo below with the classic, distant “Boonton” look). 3 Bonaparte’s Gulls were resting in the water. In the morning, 25 Bonaparte’s Gulls were viewed (Simon Lane). Tringas are here. A few isolated reports of Greater and Lesser Yellowlegs occurred last week. Today, there were 3 Greater Yellowlegs and 1 Lesser Yellowleg at Melanie Lane Wetlands along with 28 visible and actively feeding Wilson’s Snipe. The Blue-winged Teal count is now 4. 2-3 charcoal-dark Rusty Blackbirds continue to be found along the south end of the area. 2 Northern Shovelers are still present as well as 20+ Green-winged Teal and Gadwall. 2 Greater Yellowlegs were also seen today at the “Snow Goose” temporary pond of Beacon Hill Rd., Long Valley (David Bernstein). 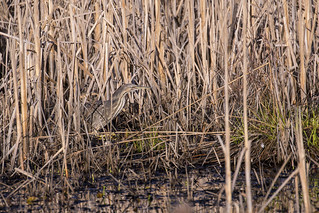 (American Bittern, Great Swamp NWR, Apr. 12, 2015 – photo by Simon Lane). In general, reports of the following species are coming in: Chipping Sparrows, Broad-winged Hawks, Brown Thrasher, Blue-gray Gnatcatcher, Eastern Towhees, Field Sparrows, etc.